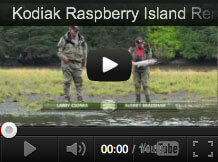 Kodiak Islands, Alaska: We are a beautiful, full service Kodiak Island Wilderness Lodge located on Raspberry Island, in the Kodiak Island Archipelago, Alaska. We offer all inclusive packages that include Kodiak Halibut Fishing, Kodiak Salmon Fishing, Kodiak Bear Viewing, Sea Kayaking, Hiking/Backpacking, and Photography of Alaska’s Wilderness and Alaskan Wildlife. We are Truly Remote; nearly twenty miles away from the nearest community and every window offers a view of the surrounding mountains or ocean. Private Guest Cabins with indoor bathrooms, delicious Fresh Alaskan Seafood, hydroelectric power, wireless internet, complimentary locally brewed beer on tap as well as wines paired to each evening meal, and customized service are just a sampling of what you will enjoy on your vacation. Kodiak Fishing offers many rewards in both the sport value and table fare of the many different fresh and salt water species of fish that we can target, including all five species of Pacific Salmon, Lingcod, Yelloweye Rockfish, and big Pacific Halibut. Our two custom built thirty-six foot aluminum catamarans, complete with fully enclosed heated cabins, private bathrooms, full electronics, and all the top of the line fishing gear you’ll need during your stay. Thanks to our remote location, we never have to travel far to fish. If you chose to harvest your catch, we include in our packages the professional care, handling, filleting, vacuum sealing, labeling, freezing, and boxing of your fish every day. Fly Fishers and spin fishers enjoy our climactic Silver (Coho) Salmon returns in September. Our favorite streams fill with salmon and are surrounded by long, sandy beaches, tidal estuaries, shallow flats, and old growth Sitka Spruce forests. It is a pleasure just fishing these rivers, and the catching can render even the most veteran fly fisher to giggles. Though the incredible fishing is certainly one of the major attractions to Kodiak Raspberry Island Remote Lodge, we also focus on and specialize in Kayaking, Hiking, Photography, and of course, the famous Alaskan Brown Bear! These trips offer not just viewing, but participation in, Alaska’s Wilderness. All activities are fully guided and outfitted. 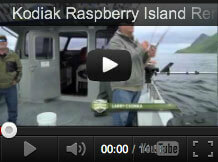 We are second generation to Kodiak Raspberry Island Remote Lodge and the Kodiak area; we know the area, we know the fish, and we want you to have the time of your life! We invite you to enjoy this website and we hope we might be included in your Alaskan vacation plans! I find myself smiling some days thinking of what a wonderful place Raspberry Island is. Great people, fishing, food, views…. You know! Thank you for everything. Everyone I have talked to has asked about the Raspberry Island experience and I have found it turns out to be a 30 to 45 minute description. You know this is weird but I cannot stop thinking about that area and everything that makes it special.